Powers/Abilities: Dr. Bruce Banner and Rick Jones would uncontrollably merge into one being, the Hulk, whenever one of them got angry. History: (Marvel Vision#16 - Timeslip) - When Rick Jones drove out on a gamma bomb test site, Dr. Bruce Banner rushed out onto the site to save him. Unfortunately, Banner arrived too late and both of them were bathed in gamma radiation when the bomb went off. 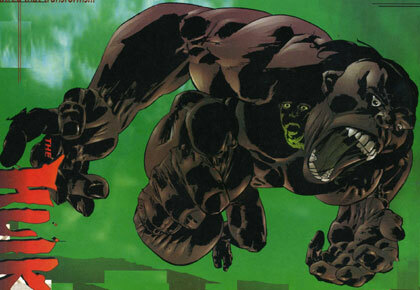 After their bombardment, whenever one of the two would grow angry, the two of them would merge into a single being called the Hulk, regardless of their location. Weeks after their transformation, it was discovered that their curse would be ended should one of them die, prompting Rick Jones to hunt out Dr. Bruce Banner. While Rick searched for Banner in an attempt to kill him, Dr. Banner frantically searched for a different cure for their condition. Comments: Created by Jim Krueger and Tony Salmons. Hulk's reality diverged from Earth-616 when the gamma bomb went off, merging Rick and Bruce together, unlike the events of Incredible Hulk I#1.